In Africa, Can Hillary Clinton Be Obama’s Substitute Preacher? A month ago, Barack Obama made his first trip to Africa as President and, while in Ghana, delivered a message of support tinged with impatience with leaders who have not been held accountable for their misdeeds. His Kenyan ancestry and the continent’s nearly universal adoration for a man it sees as an African son put him in the rare position of being able to say such things without being viewed as a neocolonial scold. Now U.S. Secretary of State Hillary Clinton has embarked on a mammoth seven-nation Africa tour to follow up her boss’s sermon with preaching of her own. But can she bank on the same reception he got? Kenyan officials, sitting next to Clinton when she spoke, did not react, but she did get a hearty laugh, followed by applause, from the mostly young people in the audience. Indeed, if Odinga thought to play into anticolonial feelings, he appears to have miscalculated. 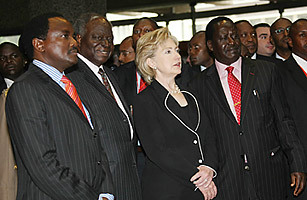 Most Kenyans share Clinton’s views. “It is actually a shame that we need pressure from the U.S. to do what is right,” the Daily Nation said in an editorial on Thursday. “I think she’s done a good job of insisting that we put our house in order,” said a man awaiting her appearance at a town-hall meeting on Thursday. Africa’s putting its own house in order is indeed a goal of the new U.S. policy, and Clinton’s trip is part of American efforts to separate the U.S. stance from the donor-recipient relationship of old. She told a forum for the Africa Growth and Opportunity Act that Washington wants to be a “partner” and not a “patron.” And so, in her first two days in Africa, apart from calling out the Kenyan government on corruption, she urged Eritrea to stay out of Somalia’s affairs, lamented the killings and rapes that continue in eastern Congo and warned of the threat of terrorism in the Horn of Africa. Before leaving Kenya for her next stop, South Africa, Clinton met with Somali President Sheik Sharif as part of U.S. efforts to help the weak Transitional Federal Government fight the militant Islamic al-Shabaab insurgency, which is supported by neighboring Eritrea. She was clear that this was in Washington’s interest, warning that “if al-Shabaab were to obtain a haven in Somalia which could then attract al-Qaeda and other terrorist actions, it would be a threat to the U.S.” To make the point, Clinton visited the site of the 1998 bombing of the U.S. embassy in Nairobi. Al-Qaeda was believed to have been behind the twin bombings in Dar es Salaam and Nairobi that killed more than 200 people.